Sunbeams rooms are children friendly spaces. Children access materials independently and activity zones provide for communication friendly spaces. The children have, under adult supervision, free flow access to the play garden which is surrounded by trees providing a full experience of all seasons. We offer forest school sessions, messy play, sensory play, cooking club, painting, gardening and sand box. Sessional or all day childcare with term time bookings available. Please phone or email to enquire about vacancies. Free sessions for funded 2 year olds. Sunbeams offers flexible bookings and hourly rates are payable in 1/4 hours. The rate for the over threes and under threes is different. Variety of sessions and discounts available - for full details please phone or email. Breakfast - £1, Lunch - £2.50, Dinner - £1. Sunbeams offers flexible start and finish times and bills up to 1/4 hour. Forest school sessions are held in the school grounds. Children over 3 years have breakfast and afternoon tea in the family room and join the pre-school between 9am to 3pm. Large outside gardens for both rooms. Open for 50 weeks a year. Strong links with all local schools. Older brother and sisters can join Sunbeams during school holidays and after school. Parents can use their Early Education entitlement at any time during opening hours. lease note that a place in a school nursery does not guarantee admission to the school on site. Parents/carers must apply for a place at the school if you want your child to transfer to the school’s reception class. See www.dorsetforyou.gov.uk/school-admissions for more information and to apply’ . Roadside parking in front of the school with a disability bay in the school car park. Special Education Needs Coordinator, staff trained in positive behaviour management, staff trained in speech and language support, staff trained in understanding of autistic spectrum. Communication friendly spaces and calming areas. All learning activities available outdoors and indoors in Zoned play areas. Sunbeams has 2 trained SENCOs. The nursery offers support for developmental delay, language delay and behaviour. 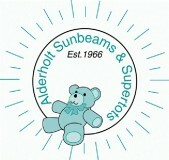 Sunbeams can refer to Hampshire and Dorset speech and language support. Practitioners have worked closely with Dorset and Hampshire Portage services. We have completed EHCPs. For more details please phone or email.